Internationally known for their big ring gauge, perfection, and collector status, La Gloria Cubana cigars have been legendary since they first appeared in cigar stores nationwide back in the early 90’s. When the renowned La Gloria Cubana Serie R cigar entered the market, it was an instant hit among cigar smokers and still maintains that prestige today. 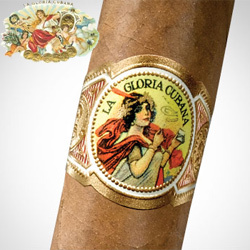 La Gloria Cubana cigars are considered by many aficionados, reviewers and critics to be their "go-to cigar." The new release, the La Gloria Cubana Serie N, has people searching high and low, so be sure to grab a box because you will love them.